This is the third and the last case of the Proofs of the Inscribed Angle Theorem. In the first case, we used an auxiliary line between the sides of the angles to come up with the proof. In the second case, we drew a line segment from the center to the intersection of the circle and one of the sides to form an isosceles triangle. In this case, we cannot do both. 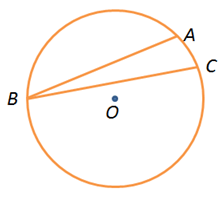 To prove the third case, we will draw an auxiliary line outside the circle. We draw segment through the center of the circle. The detail of the proof is as follows. is inscribed in circle O. Now, . by the consequence of the Angle Addition Postulate. 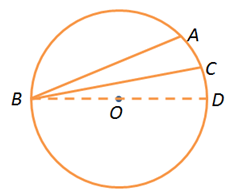 by Case 2 of the Inscribed Angle Theorem. (Hint: Draw and ). Factoring out , we have . Note: The notation means measure of arc .